Borderline personality disorder (BPD) is a severe and complex psychological disorder characterized by pervasive emotion dysregulation, unstable relationships, impulsive behavior, and recurrent suicidal and non-suicidal self-injury (NSSI). PTSD is one of the most common co-occurring disorders among individuals with BPD, with comorbidity rates ranging from approximately 30 % in community samples (Grant et al. 2008; Pagura et al. 2010) to 50 % in clinical samples (Harned et al. 2010; Zanarini et al. 1998). There are several theoretical models to explain the high comorbidity between BPD and PTSD. Some models focus on the common etiological factors between the two disorders. For example, childhood abuse has been implicated in the development of both BPD and PTSD (Widom 1999; Widom et al. 2009). Other models propose that PTSD mediates the relationship between trauma exposure and BPD criterion behaviors. For example, PTSD symptoms of reexperiencing and avoidance/numbing have been found to mediate the relationship between childhood sexual abuse and NSSI (Weierich and Nock 2008). Finally, some models suggest a reciprocal relationship such that each disorder functions to maintain the other. For example, PTSD has been shown to exacerbate BPD criterion behaviors, such as emotion dysregulation, suicide attempts, and NSSI (Pagura et al. 2010; Harned et al. 2010; Marshall-Berenz et al. 2011) and to decrease the likelihood of achieving diagnostic remission from BPD over 6 and 10 years of naturalistic follow-up (Zanarini et al. 2004, 2006). Conversely, BPD is associated with high experiential avoidance (Iverson et al. 2012), which is likely to maintain PTSD (Shenk et al. 2014). Given the multiple and complex relationships between PTSD and BPD suggested by these models, successful treatment of both disorders is likely necessary to achieve optimal outcomes for individuals with this comorbidity. 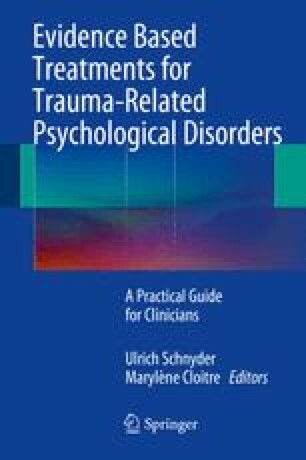 In this chapter, we will review research on treatment approaches for individuals with PTSD and BPD, discuss common challenges that arise during trauma-focused treatment with this population, and present a case example.